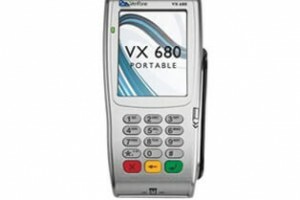 The VX 680 is a small, full-function, portable, handheld payment device with a large, color, touch screen. Carry brilliance and complete transactions in a small, portable, handheld device: the VX 680 Portable. Merchants on the move - from delivery services and stadium vendors to restaurant pay-at-the-table service providers - can process on-the-spot transactions with minimal consumer waiting time.